Sign installation service are offered nationwide. 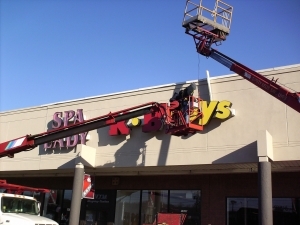 Sign-Express has a network of qualified sign installers that can perform your sign installation needs. We are licensed and bonded in all states. Site surveys, sign foundation sets, pole sets, wall sign installs and more are just some of the services we offer. No job is too large or small. Contact us today to receive a sign installation estimate. *Please all 48 hours for estimates, provide as much detail as possible to ensure the estimate is accurate.